I try and watch a new version of CHRISTMAS CAROL every year. I’ve managed to do it more than I haven’t, which isn’t too hard considering there seem to be hundreds of versions. 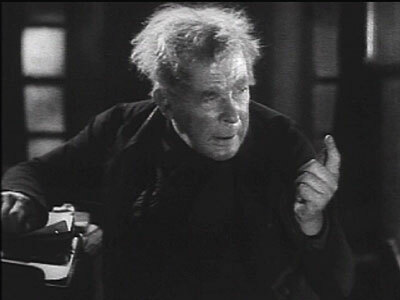 This one, SCROOGE, is from 1935 and it stars a man who had been playing the character for years on stage, and had even done a silent version years earlier: Seymour Hicks. I watched SCROOGE (1935) on 12.20.14. It was my first viewing of the film. With any version of Dickens’ most famous of Christmas stories, a few questions usually loom larger than all others. 1) How good is Scrooge? 2) How much did they change? 3) Do the ghosts work? Taking these in order, Seymour Hicks is a very strong Scrooge. He feels like a man who has lived that life, not like a man putting on a part. His Scrooge is mean enough when necessary, and nice enough at the end. Some of his line deliveries come out of a place of truth rather than a nearly century-old institutionalized understanding of how Scrooge’s usually say things. And while it could be said that Hicks’ Ebenezer is very quick to go from old curmudgeon to nice guy, that seems to be a fault more of the script than the acting. And, about that script, this is a film which takes it’s share of liberties with the story and with the cuts. Despite a run time of just around 75 minutes, we get nearly a full 30 in before the ghost of Jacob Marley shows up (well, sort of shows up… more on that in a second). In the meantime, we see lots of dark street scenes and a weird sequence where a bunch of rich people, led by the mayor of London, sing to the Queen. The point is to show the divide in the classes, sure, but it is an odd course deviation for the film. Much of Scrooge’s past is left out of the script, with that portion of the film on focusing on the time when he is engaged. From there is mostly follows along, though an odd choice is made to have the famous “God bless us all, every one” line be spoken by Scrooge himself rather than Tiny Tim. I guess they could get away with that in 1935, though that is such a staple of the story today that it would seem odd in a modern movie. The ghosts of this SCROOGE are unique, sometimes successfully so. Jacob Marley actually is just a voice over. 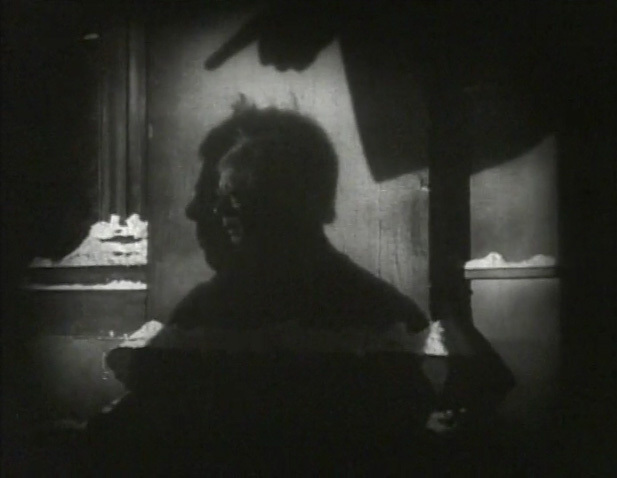 Director Henry Edwards plays off of the book’s observation that only Scrooge can see Marley by extrapolating that out into the movie where even the audience is not able to see him. This creates a weird and less effective sequence in which Scrooge talks to a chair. Next is Ghost of Christmas Past. This is a shapeless void with a voice. We see a silhouette, but no body. This works save for the truncated nature of the past sequences in general. Ghost of Christmas Past is the traditional big guy in a robe with a fat laugh. He is standard, boring, and effective. Ghost of Christmas Future is actually pretty awesome. While he is the usual grim reaper type, we only ever see him in shadow. And inside all of these sequences, Scrooge appears as a small face set inside his own silhouette. It is a cool look. Another good thing it has going for it is the Cratchit Family. Often this family devolves into a bunch of high pitched squealers all vying for Dad’s attention. The family, here, is more nuanced and solid. And Bob’s scene after the death of Tim is played with positivity instead of sorrow. It is the first time that approach has landed really well, and it makes for the best screened version of Bob Cratchit (even if it is followed by a weird added scene where Bob embraces Tim’s dead body). Despite all of these good moments, this is a film which is still limited by being a 1935 film. The exterior shots, which seem to be shot night-for-night are almost unseeable. The interior stuff looks better, but the print TCM has leaves a lot to be desired. While there is a whole bunch of good filmmaking going on, this doesn’t really come across a movie to seek out, or a movie which would engage a modern audience. It is a novelty, instead. Or, said another way, you’d probably have to be at least your fourth or fifth Christmas Carol into the well before making this the one you’d put on. The bonus is for the Christmas Future sequence. This movie does it the best I’ve seen it done when it comes to creating a creepy and effective mood. ~ by johnlink00 on December 20, 2014. I finally read the story this year. It was a great read. I can see why it has been such a big movie throughout the years. Nice post.